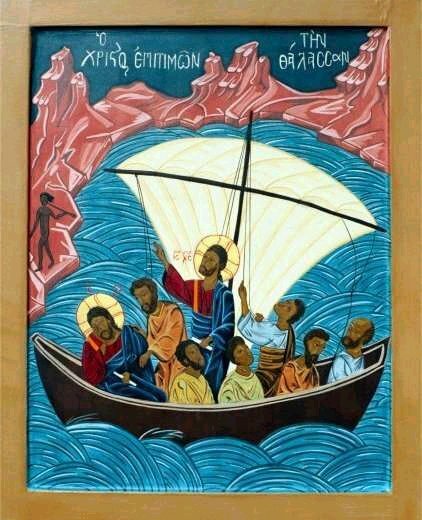 In the Gospel of Mark there’s the well-known story of Jesus and his disciples in a boat during a raging storm. But Jesus isn’t just in the boat, he’s actually sleeping. During a raging storm. The disciples of course are freaking out and, rightfully, fearing for their lives (the boat is already swamping). They finally wake up Jesus and cry “Teacher, don’t you care that we’re going to die!? !” Jesus rebukes the storm and it calms away, then rebukes the disciples, asking “Why are you afraid? Where’s your faith?” The disciples are amazed at Jesus’ power, that even the terrible weather obeys him. Reading that story, it’s easy to be hard on the disciples. “Of course they didn’t have to fear, Jesus is all-powerful,” we think. “He can’t die there anyway.” But I wonder if the disciples would have been any less afraid had they known that? Jesus was sleeping – it didn’t look like he cared or was doing anything to help them, while the wind and rain and waves were raging all around them. How different are we from the disciples in this situation? When the storms of life batter us, do we wonder if Jesus cares or if he’s doing anything? Or worse, do we forget that he’s even there with us? Or do we trust that he will see us through them? The more we know (head) and know (heart) that Jesus is all-powerful and present with us, the more we see him moving in and through and around our lives, then the more we will instinctively trust him. In any case, the disciples made the right call on what to do in that situation, and so should we in ours – call on Jesus to save us. Just as Jesus is master over the stormy weather, he is master over the storms in our lives as well. He is with us, and though it may not look like he’s doing anything we can trust that he will see us through now, just as he did the disciples back then.